Riccardo Montolivo Re-Emerges As Captain of Milan – AC Milan Bros.
Flashback to May 31, 2014…. Italy took on Ireland in a pre-World Cup friendly. A simple tune-up match ahead of the world’s most watched tournament. But just days prior to the 2014 FIFA World Cup in Brazil, Milan captain Riccardo Montolivo suffered a serious leg injury that not only ruled him out of the cup but also knocked him down the pecking order with the rossoneri. Montolivo arrived from the viola back in 2012 on a free transfer and at the time, the move was considered a classic Galliani transaction. Riccardo was in the prime of his career and was coming off a solid campaign in 2011/12 with Fiorentina. He was surely welcomed to the club as his creativity and ball distribution would be an asset for then-manager Massimiliano Allegri. In a November clash against Juventus where Daniele Bonera, Massimo Ambrosini and Christian Abbiati were all unavailable to wear the armband, Montolivo first wore it for the club victoriously 1-0 over the bianconeri. Playing in 39 matches across all competitions that season, the former Atalanta youth player was in line to be awarded an honor. Montolivo was granted the armband back in 2013 after former holder Massimo Ambrosini did not extend his contract with the club. Adriano Galliani had publicly stated that the former Fiorentina midfielder would be given captain status. Riccardo Montolivo will be the new captain of Milan. I spoke to Christian Abbiati and he said that he had no problem with this. At the moment nobody in Spain, except for Real Madrid and Barcelona can afford to spend 20 million on a player and for us Riccardo is not for sale so no we have not received any offers from Spain. I like the way Montolivo’s name sounds when you pronounce it. After many longtime Milan players departed seasons prior and with few ready to take the armband, it seemed as if Montolivo was the obvious choice. He followed up his debut season with another steady Serie A campaign in 2013/14, appearing in 37 total matches, scoring three goals while assisting seven. But in May 2014, everything began to crumble. Montolivo was named to Italy’s 30-man preliminary squad for the 2014 FIFA World Cup by Cesare Prandelli. Most assumed he would be a starter in Brazil. However, in a May friendly ahead of the tournament, the Italian would have his World Cup hopes come to an end as he suffered a broken leg in a match against Ireland, ruling him out for a substantial amount of time. Marco Verratti stands beside the injured Italian midfielder Riccardo Montolivo in a pre-World Cup friendly against Ireland in May 2014. Even though the 31-year old made his return just six months after the injury against Udinese, his captaincy and place in the squad was no longer a guarantee. Nigel de Jong – now with the LA Galaxy – had virtually replaced him as captain even though the armband never changed hands. De Jong had become a favorite by all Milan supporters to take control of the role and to be honest, he deserved it. The Dutch international was ideal for the captaincy, with his leadership, energy and passion for the kit. The strong campaign for De Jong as captain made the vast majority of the Milan universe turn their back on Montolivo. After Clarence Seedorf was appointed manager in January 2013 in place of Allegri, the two individuals immediately did not see eye to eye. A continuous butting of heads along with a lack of harmony in the dressing room led to the firing of Seedorf just months into his first managerial gig. After Seedorf was sacked, Milan’s captain did not stand down, publicly expressing his opinion on the manager’s dismissal. With Seedorf, there wasn’t much harmony. The decision to sack him was for the good of Milan. At this time, Montolivo was not exactly in the best place with the fanbase. It was arguably the lowest point in his Milan career. In 2014/15 under Pippo Inzaghi, Montolivo managed to find the field in 10 league matches, a tally not fit for a captain. In the summer of 2015, rumors loomed of his departure and it seemed as if his stint at the San Siro was all but done. Out went Inzaghi and in came Mihajlović, with Montolivo left with a whole lot to prove to his manager, the fans and the organization. Siniša Mihajlović was selected as manager of Milan this past summer and had an immediate fondness for the 4-3-1-2 formation. Of course, De Jong was the first choice to play as the defensive midfielder and he did just that early on, starting each of the first two matches of the season while also being the team’s captain. The rossoneri suffered a opening 2-0 loss away to Fiorentina at the Stadio Artemio Franchi but followed it up with a bounce back, 2-1 win over Empoli. In each of these matches, Montolivo did not feature, but he finally got his first chance to prove that he deserves a starting role when he donned the armband and played a full 90 minutes in a hard-fought 1-0 loss to city rival Inter. We saw a more creative Milan with Montolivo playing deeper in the midfield, picking his passes and being the key source of opportunities. Since being given the nod to start in the Derby della Madonnina, Montolivo hasn’t looked back. I’d like to thank Conte for showing faith in me and giving me confidence. Today, I put a negative period behind me as I hadn’t played for Italy in 17 months. I’m happy to be a part of this group. Mihajlović made the switch to a 4-4-2 months back when he knew the proper man to play behind the strikers wasn’t there. In return, this tactical decision allowed players like Giacomo Bonaventura, Keisuke Honda and Juraj Kucka to thrive. Since then, results have been nothing but positive as the club currently holds a nine match unbeaten streak. We are seeing a more consistent side, top to bottom and Montolivo has been at the heart of it. He has given the club a playmaker who can expand the field, open up quality chances, break up in the midfield and contribute defensively. Of course, the current form of Milan should not be entirely credited to Montolivo. Sure, we can point out his individual performances, but as a captain of Milan, you are held to a higher standard. You must lead by example on and off the pitch; before and after the match. It seems as if we are seeing a more united squad led by Mihajlović and the results are coming. For that, praise must go to the former Sampdoria boss for believing in Montolivo and allowing him to prove that being knighted the captain’s armband back in 2013 was the right move. It’s just taken some time for all to see that. 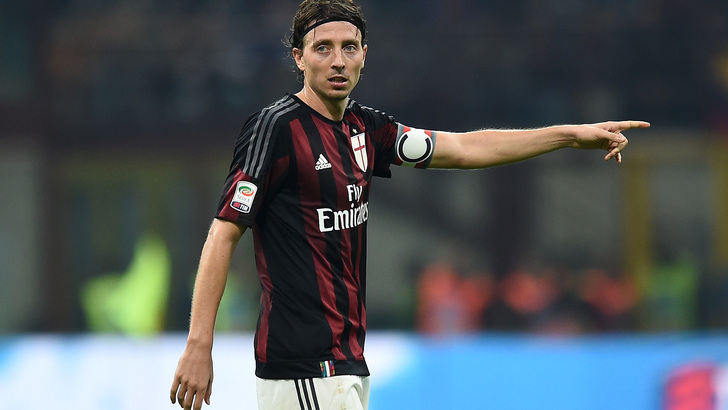 A rejuvenated Riccardo Montolivo wearing the captain’s armband during a Serie A match. The Serbian tactician has his men full of confidence and rapidly climbing up the Serie A table. With the 1-0 win over Torino on Saturday, the rossoneri are 6th in Serie A. They sit just a single point behind Inter for 5th, and six from Fiorentina for the final Champions League spot in 3rd. The squad now appears to be finding chemistry and things are looking up in the Milan camp. It looked foggy for Montolivo over the past few years, but with his emergence in the side, it seems that Milan have been returned their captain in time to make a strong push for European qualification.